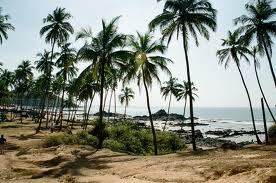 Chapora beach of Goa is a small fishing village located at a distance of 10 kilometers from Mapusa in north of Goa. It has managed to ward off commercialization and too many tourists by being essentially a fishing village. The Chapora beach has retained its natural charm and maintains itself on a meager budget and constant efforts of the local villagers. It is nestled under a thick canopy of coconut trees and though the beach is not as vast as other commercialized beaches, tourists come here since it is less crowded and serene.